I don't have the time for a full face of glam and honestly, I'm just too lazy. With it being summer time as well, I like to keep my makeup routine quick and light. In this case, less is more. I always use a primer, even if I am not using a foundation. 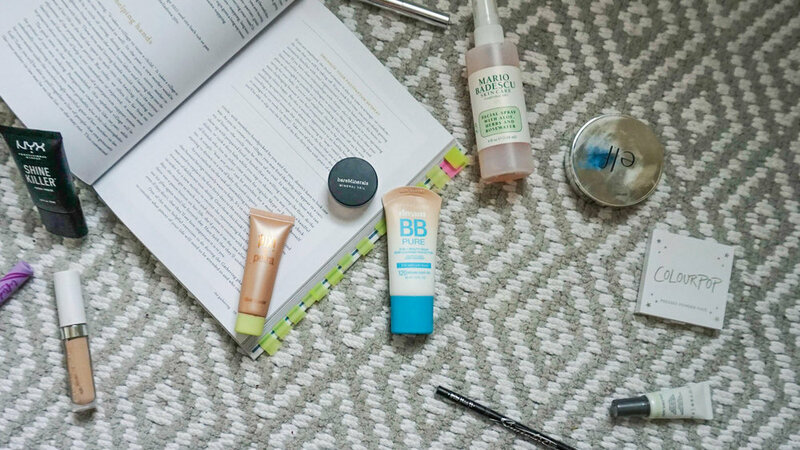 Depending on the needs of my skin, I feel like a primer really helps blur and smooth the appearance of your face. I am currently trying out the Cover FX Mattifying Primer with Anti-Acne Treatment. So far I really like it. I really enjoy the feel of the product when applying and it doesn't make me feel greasy. Now depending on my needs and time, I'll either spot conceal with my Colourpop No Filter Concealer or use a tinted moisturizer or BB Cream. I'm currently on the hunt with one that has SPF and doesn't make me look like a ghost! The BB cream I'm currently using is the Maybelline BB Pure 8-in-1 Beauty Balm Skin Clearing Perfector. This too is an acne treatment and contains 2% salicylic acid. I'm not obsessed with this, and it could be due to the color but I make it work. With someone who has oily skin, I always set with a powder. I love the E.L.F Beautifully Bare Sheer Foundation Powder. It gives me some extra color and controls the oils. Next is brows and mascara. I am loving this new Kat Von D brow pencil and the ABH (Anastasia Beverly Hills) Clear Brow Gel. This combination gets me so many compliments. For the lashes, I've been using the Tarte Lifted Sweatproof Mascara which is amazing. It's great for summer because it's hot and in hot weather, you sweat a lot, and you don't want to sweat off your mascara. It's dark brown color gives the lashes a beautiful natural finish while lengthening. Sometimes I add on a bronzer but it really just depends. I really like the Colourpop bronzer and I can't remember which shade I have but it's so nice. Sometimes I'll add a liquid highlighter such as the Pixi Glow Booster when I don't want to use a blush. After, I just spray my face to really melt everything together. The Mario Badescu rose facial spray is so good with and without makeup. And just like that, I'm done. It may seem like a lot but it's not. Most of this stuff can be applied with my fingers which helps out a lot. Because I am always in a rush and I opt for a 10-minute makeup routine, you'll find a lot of my everyday makeup essentials from my previous post in this one.